This is a guest post by Rebekah Johnson. Those early years of mothering, they just didn’t fit me quite right. Ya know, like how you feel when you try on one of those rompers and you just keep tugging and twisting it, hoping to get it to lay just right. Something about a newborn felt odd, and unknown to me. My body seemed foreign, my routines were in the diaper genie. I wasn’t sure what had changed in me, or what was to remain the same. That little babe on my chest, at times, didn’t fit quite right. This is how motherhood felt for a couple years. I would look at my reflection in the metaphorical mirror and tug and twist this awkward new title of mom. The struggle, was very real. In an attempt to silence the fear of failing as a mom, I overcompensated with tight and rigid schedules and extreme expectations. That control birthed other bad habits and misconceptions—like that mothering was something at which to win. I tried to find the grid for good mothering through cyber world. What started as simple sleep training sadly became an opportunity to feel in control. His sleep habits -- and later his behavior would prove to the world that I was creditable. Although I couldn’t put words to it at the time, I often thought this job was to make me look good. Sadly, I missed out on a lot of joy and a lot of freedom as a young mom. Insert a faithful God. A few years later, with three little boys in tow, God brought my husband and I to a season of job losses, discipline, and uncertainty. This land of loss was the ground on which God freed and changed us in many ways. Losses, upheaval, and broken relationships left us a broken mess at the feet of Jesus. Yet the gospel that saved me as a child rushed in, awakening my need for it anew. As I soaked in the mercy of God, the gospel became part of my daily walk once again. I ceased the march of a spiritual robot and began to learn the cadence of grace and dependence. This transformation spread to every corner of my life, including motherhood. My role as a mom moved from performance to an overflow of the good news, and with time—motherhood became my worship. As the season of healing and transformation continued, I opened to the book of Hosea. The prophet, Hosea, was given the most unusual task to accompany his sermons to God’s unfaithful people. God asked him to marry an unfaithful wife, that the prophet might understand what God was experiencing as his people turned away from his love. Within the pages of Hosea, I found the Gospel. The jealous love of God popped off the pages, revealing to me that every loss and even discipline was a display of his affections for me. Withered dreams were his redirection, that I would be near to him. Dissolved hopes were his gentle guiding back again, close to his love. Wounds, even those gaping and ugly, were opportunities for him to make me new. Furthermore, I identified a misconception I had believed about God, that affected my role as a mom, wife, and friend. After so many years of Christian living, I had begun to think I was God’s little helper. The problem with this is that I began to see God as my boss, and I therefore regarded him as someone to keep at a professional distance, stiff arming his intimate love for me. The book of Hosea invited me to consider God as husband, rather than master. The words of Hosea invite us to see God not as a boss to impress or to keep at a safe distance, but as a husband in which to draw near. As my mind reconsidered my view of God, my heart for God was refreshed, and with it—my mothering. Once seeing myself as the greatly loved and greatly forgiven bride of God, my mothering moved toward worship. Although I still fumble awkwardly through parenting, I no longer march it out like a dutiful solider, or flex my way through like Wonderwoman. Rather, I feel freed by my weakness, knowing that every moment of weakness is what qualifies me for salvation. When I yell, when I’m lazy, when I throw bigger fits than them—at each of these times God invites me near to himself, that I might rejoice in his perfection and strength. Mommas, each hour within each day, is an opportunity to respond to the intimate love of God. He loves us, and promises to be the perfection that we cannot be. He pursues us, and invites us near. And once there, he beckons us to keep our roles as momma tightly tethered to our identity as God’s beloved. * Affiliate links used where appropriate. Thank you for supporting the brands that support this ministry. 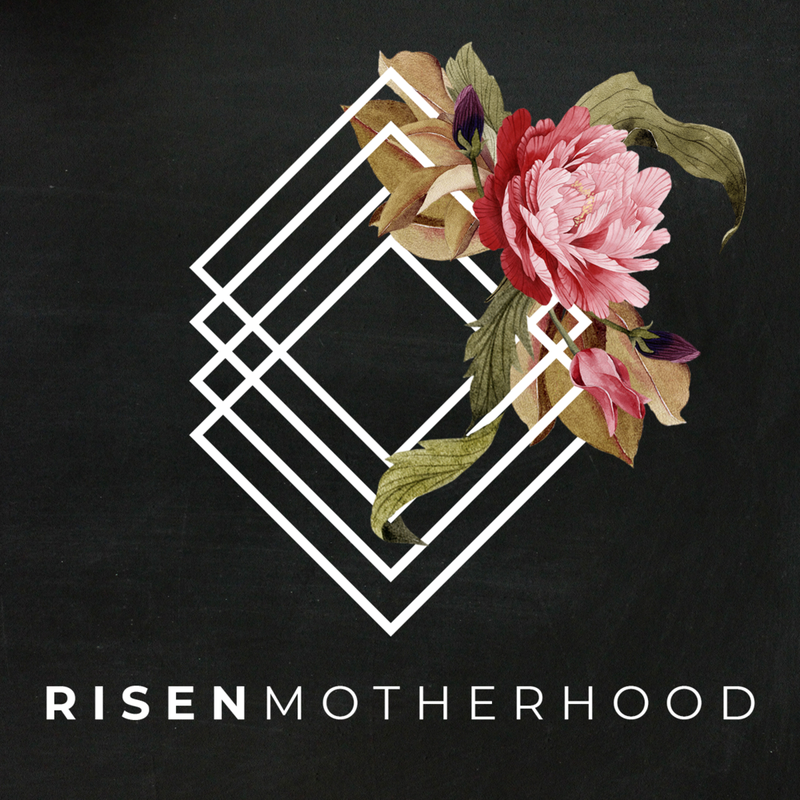 At Risen Motherhood, we love talking about how the gospel-matters in every little thing in motherhood - even washing dishes and drinking your fourth cup of cold coffee. 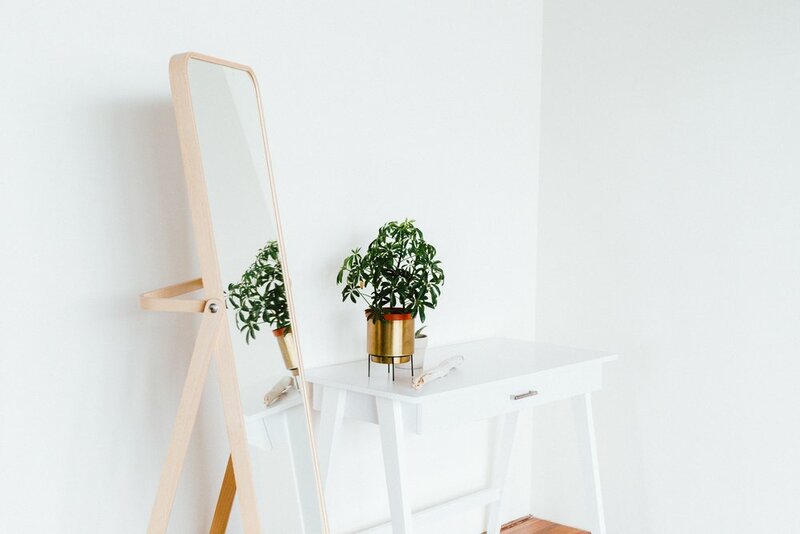 So that's what this space is all about - it's a place for intentional motherhood - to give grace, not guilt, and encouraging one another to live in light of redemption. On each show, we tackle different issues in motherhood, discussing how the gospel applies and how we can lived changed in light of redemption. New episodes come out every Wednesday. Get new episodes and blog posts sent directly to your inbox. LOOKING FOR BIBLICAL RESOURCES YOUR KIDS WILL LOVE? Check out our resources page for everything from our favorite books on motherhood to quiet time materials, the best gospel-centered kid's music or ideas to implement to keep Christ the center of your holidays. Help Risen Motherhood create more content like this! 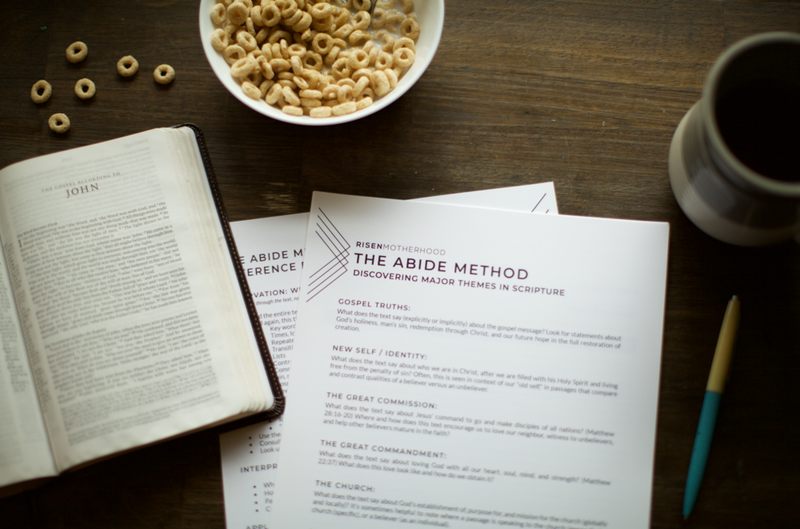 Check out our free tutorial for studying the Bible using the Abide Method. With step-by-step instructions and free printables, we pray these resources will equip you to grow in your knowledge and love of God. Bring your children along with you in studying God’s word with our FREE Abide Kid’s Cards. 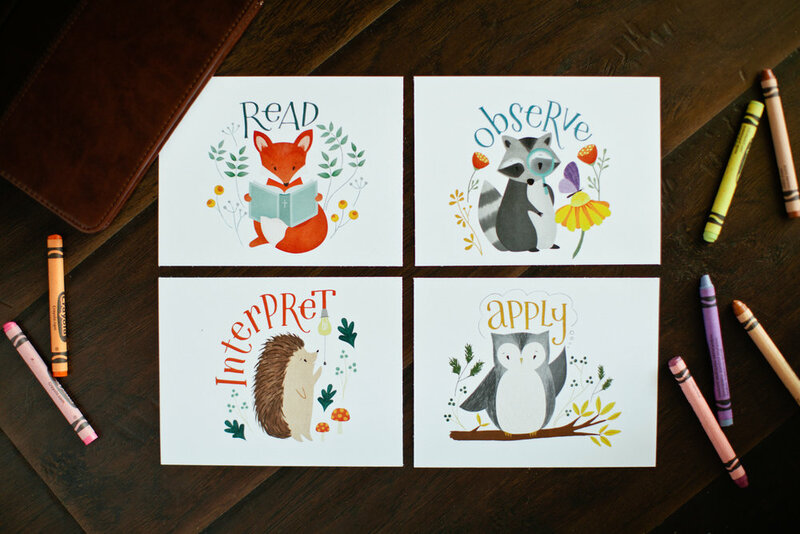 With engaging illustrations and instructions for each step, these cards make it simple for your entire family to engage in study.